This morning I fished with brothers Zach (10 years old) and Jessie (15 years old), the sons of Lindsey and Toby W., recent transplants from Ft. Worth to Belton. Keeper hybrid were hard to come by today, but, we had some very memorable early morning topwater action and some mid-morning mixed-bag angling to enjoy thereafter. 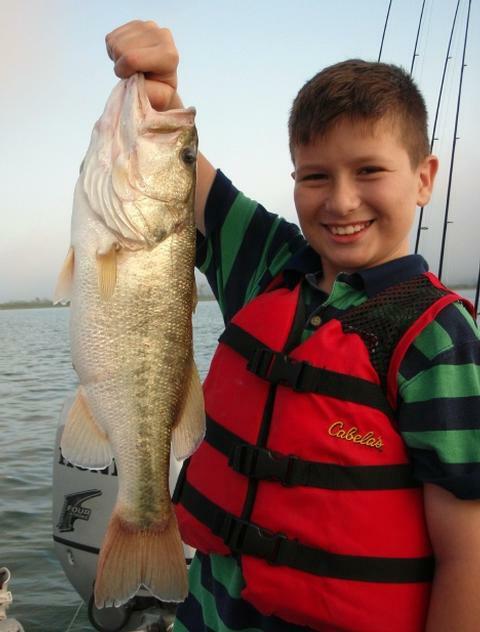 Zach and his cousin Reese fished with me last Monday on Stillhouse and he just got bit by the fishing bug. He went out on two occasions on his own to Belton with his last trip resulting in just one small catfish, so, he was ready to get back on them and put some fish in the boat. His mom and brother were only too happy to support that cause, and we all had a good time out on the water trying to stay on the fish this morning. Things got off to a great start as we spotted some light topwater action just before sunrise at Area 016/147. We used some small soft plastics and then transitioned to Spook Jr.’s as the action got more aggressive. None of the the 3 had a lot of experience with spinning gear, so, there were the normal learning curves to go through, but, the practice we did on the dock before starting our trip really paid off and all 3 were able to boat multiple fish before the bright July sun sent them swimming for the depths. We boated 23 fish from this schooling action before things died, all in about the first 45 minutes of our trip. By comparison, the remainder of our trip would only see 17 more fish come over the side, so, this was our “WOOF” of a start, heading for a bit of a “whimper” of a finish. After the topwater died, things got a bit quiet as we never did have a good breeze develop to move the water around and stir things up. We downrigged and consistently put short hybrid and average white bass in the boat using a tandem rig equipped with doctored Pet Spoons. This action took place at both Area 844/846 and nearby Area 838/214, but not in between the two. 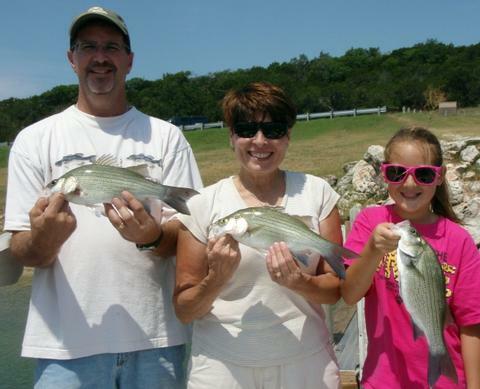 We landed 4 white bass, 1 keeper hybrid and 2 short hybrid here. When things went soft we moved over to Area 1106 and charted some scattered, suspended fish here. We got live shad down for the first time of the morning here and immediately got the blue cat stirred up. We wound up landing 1 short hybrid, 1 keeper largemouth, and 3 blue cat here before moving on. We did some looking and failed to find much at 3-4 different locations, and finally came to rest in the vicinity of Area 154/155 where we once again put live baits down. We boated 3 more blue cat and 2 more white bass here. It was now 11:45 and the sun was letting us know it was a force to be reckoned with. We decided to call it a great day right there with both boys having landed fish larger than they’d ever caught before and mom glad for the time she had to spend with her sons while school and work schedules allowed. This morning I fished with “Grand-Dad” Jack S. of Temple, TX, and his grandson, 11 year old Jackson visiting from Houston. 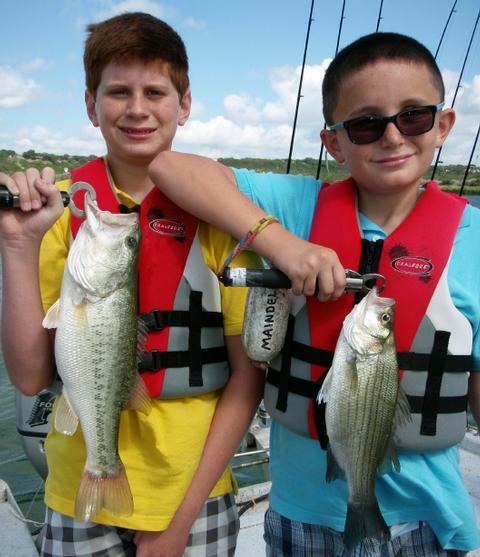 Jack and Jackson are shown here holding the best 4 of our 41 fish boated on this hot late July morning in Texas!! I normally start any trip with kids with a bit of an assessment on how the kids can use the various casting and spinning rigs that we may need to employ over the course of the trip. This lets me know how much teaching/coaching is going to be needed, and if lessons need to start at the dock or if we can simply do some “OJT” while on the water. Well, Jackson stepped on the boat, took the spinning rig I pointed out to him, gripped it, flipped the bail, and whipped out a 70 foot cast with a very light lure like it was nothing, and looked up at me as if to say, “Is there anything else I can do for you, Mister?” I knew this was going to be a great trip!! And indeed it was! We got out on the fishing grounds this morning, started charting fish on sonar holding at 23-26 feet down (suspended, as usual in the summer) and got our downrigger array set up and working. Jack had a double (2 fish on one rod) on in less than 30 seconds, and no sooner did we release his fish than Jackson got his first fish. We encountered this initial burst of activity right at sunrise, then things slumped for about 30-40 minutes, but then started building up again as the winds got some legs to it and increased to the 8-9mph range and shifted slightly W. The best 75 minutes of fishing occurred from 8:15a to 9:30a and Area 1115 was “ground zero” for this action. After 9:45 or so things started to taper off again as the skies brightened, boat traffic increased, and the wind slacked off. We’d boated 39 fish by this time including 37 white bass, 1 drum, and 1 largemouth bass. By 10am we changed up a bit and started “lift/dropping” slabs through bottom-oriented fish with precious little to show for it. 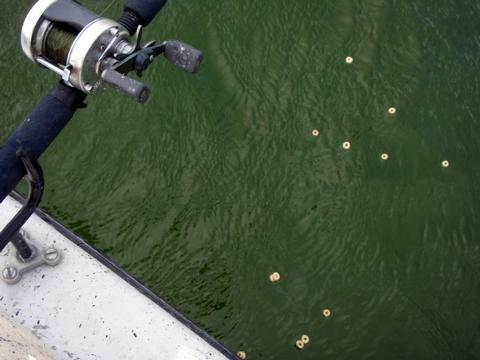 These summertime fish want that bait going horizontal and little else. We had ample opportunity today to watch a number of boat come in around us and zero by attempting to vertical jig, all to no avail, as we steadily caught fish by moving our baits parallel to the bottom. By 10:45 or so, after our first fishless spell of the day, we knew we didn’t have much time left if we were going to get one more bite so as to end the day on a good note. So, we worked together to throw a few different looks at a loosely schooled bunch of fish holding just off the breakline at Area 1116. They ignored our ‘rigger spread. Then, they ignored our slabs. So, we went back to the downrigger and used “stealth mode” by letting the baits back further behind the boat and putting them very precisely (vertically) where these fish were holding. We kind of held our breath as we went through this school of fish (for the fourth time!) and finally Jackson’s rod went off under the weight of a just-legal largemouth. We landed it with much celebration (after all, we worked harder for that one than any 10 of our other fish combined) and called it a day right there as the winds began to flatten and the heat started pouring on. This morning I fished with cousins Zach (10 years old) and Reese (14 years old), the grandsons of Elaine W. of Fort Worth. 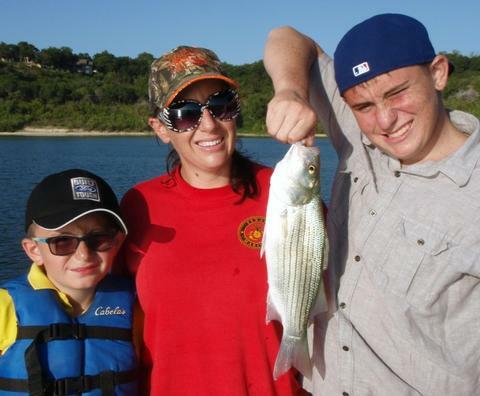 She’s RV camping at Belton Lake and was kind enough to treat the boys to this day on the water. We finished our trip with a bang today with 5+ pounds of fish landed in the last 10 minutes, including Reese’s 3.00 lbs. largemouth (above) and Zach’s 2.50 pound channel cat (below). The fish were a bit “moody” today for whatever reason. We got on a strong bite right off the bat; it lasted about 40 minutes and then there wasn’t a fish to be found where just minutes prior there was wolfpack after wolfpack of 3-10 fish each just about everywhere we looked. So, we had to hit several areas today to put together the catch that we did and, although we tried on two separate occasions to exploit some congregated fish near bottom, those fish would have none of it. If we weren’t downrigging, we weren’t getting bit — it was as simple as that. So, with 4 full hours of practice, the boys both became darn good downrig riggers today, each learning how far back and how far down to set their baits based on sonar readings, how to “clip in”, how to adjust the drag for lowering baits and then how to adjust the drag once the baits were set — pretty technical stuff, actually. We encountered significant concentrations of fish at Areas 1103, 476, 459, 1113, and 644/1114. A look at the map clearly showed me these fish were all interested in the same kind of bottom topography. This gives me clues as to what to look for elsewhere should I have to go hunting for them again before long on another “moody” day. This was a trip of superlatives for the boys. They each caught the biggest fish they’d ever caught, and they each caught the most fish they’d ever caught on a trip. Up until this trip most of their efforts have been from the shore off of “Crappie Point” on Navarro Mills lake. The boys were a pleasure to have on board and, from what I understand, greased the skids for their brothers to be able to go out with me next week! Skies: Skies were hazy and ~65% cloudy. 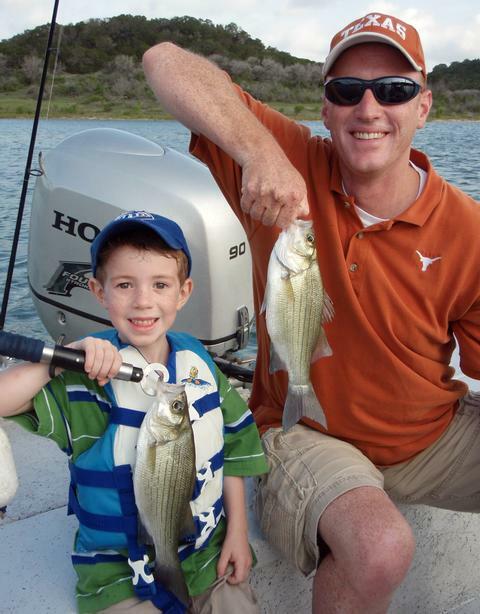 This morning I fished with Ed T. of Hutto, TX, and his 5 year old son, Eddie. We were in pursuit of the first fish of Eddie’s life !! Eddie, very capably assisted by his dad, caught 21 fish today, including the first fish of his life!! Ed contacted me back in March or April this year about introducing his young son to fishing. Although the two of them were ready to go right then and there, I encouraged them to wait until the weather and the water got warmer so we’d be in prime season for downrigging suspended white bass and for fishing for sunfish up in the shallows. This would allow for “instant gratification” which is just what it takes to get and keep young children interested in the sport. We headed out to the fishing grounds just as the sun was poking above the horizon and got our rigs set just above the suspended fish we found on sonar. Today, that was around 24 feet. We found fish loosely congregated between Areas 480 and 476 and worked doctored Pet Spoons over these fish using tandem rigs. 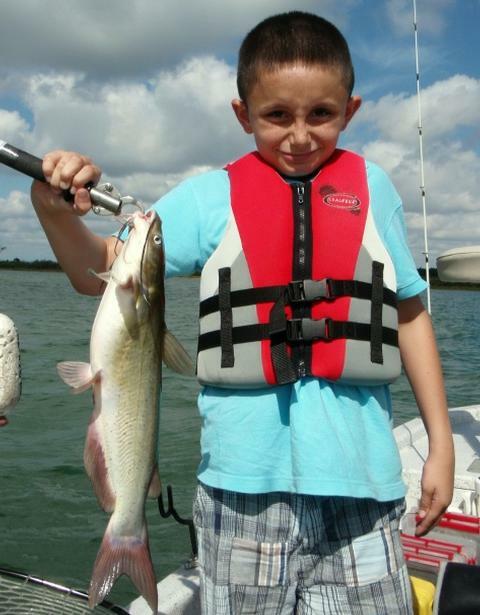 At 7:58 young Eddie had landed the first fish of his life, thus earning him a Texas Parks and Wildlife “First Fish Award”. By 8:54, he’d boated 18 more fish including a nice largemouth bass and 17 white bass, 6 of which were landed two-at-a-time on the tandem rig. By 9am or so, a long weekend of fun with cousins followed by some pool time, followed by getting to bed a bit later than planned was beginning to catch up with Eddie and he started “fading fast” as the morning heat began to build and the novelty of catch fish (even two at a time!) began to wear off. Dad and I talked him into a quick adventure up to the shallows to pluck some sunfish out of the hydrilla near Area 1111, and that resulted in one bluegill and 2 spottail shiners being added to our count. By 9:20, the fun and sun were too much, and we called it a day right there. To his credit (take note of this dad’s of young boys!!) Ed didn’t insist that Eddie stick with it, thus turning a very enjoyable trip for young Eddie into an endurance test to please dad. Ed realized Eddie had reached the limit of his 5 year old attention span and called it a day right there and then. This little thing is the thing that makes the difference between having your son as a fishing buddy for life, or having a son who says “Thanks, but no thanks” when he’s older based on the memories of what fishing was when he was younger. Good call, Ed!! As soon as I got back home and got the batteries on charge for the next trip, I got an e-mail out to TPWD requesting Eddie’s “First Fish Award” accompanied by the required photos. You only catch your first fish one time. It was great to be a part of that with a father and son like Ed and Eddie!! This morning I fished with Di A. of Riverside, California, and her nephew, Tommy V. of Indio, California. 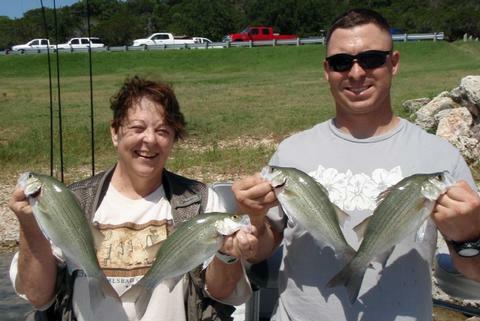 Di and Tommy boated 48 white bass today. A favorable SW wind and stable weather kept the fish active for a long feeding window this morning. Di is an engineer working for the Navy at the naval yards near Los Angeles, and Tommy is on active duty at Fort Hood where he serves as an infantryman with the 3rd Armored Cavalry Regiment (ACR). Di is close to retirement and is getting an early start on accumulating some retirement toys including the camping package she drove the 1,300 miles to Texas in as a “test run” to make sure she’s ready for some serious camping once retirement is a done deal! We got onto a solid white bass bite today on Stillhouse, with the best action of the day coming over the course of the first two hours of sunlight. During this time we primarily downrigged to stay in the midst of the patrolling schools of white bass suspended above the thermocline at the 27-29 foot mark. 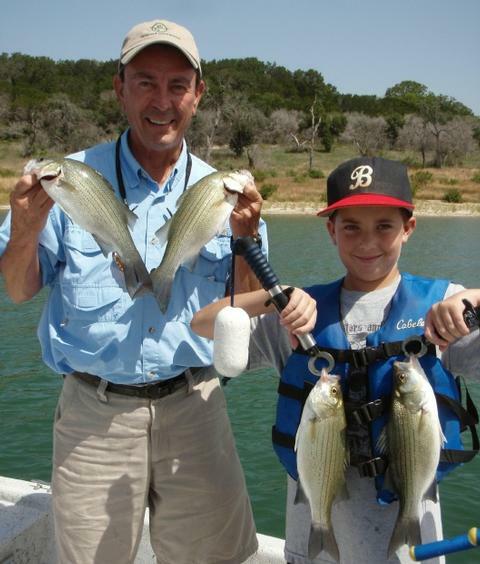 By the time the best bite was over, we’d boated 38 white bass, with most in the 13″ range. On at least 5 occasions we boated doubles on our tandem rigs equipped with doctored Pet Spoons selected to “match the hatch” given the size of the shad these white bass were feeding on. After the strong, early bite died down, we began to work more vertically with slabs and bladebaits and continued to catch fish in twos and threes as we encountered them beneath us, using both a lift-drop retrieve and the smoking tactic. Di has also recently purchased a Porta-Bote (a folding, lightweight boat) and so, after she explained to me the types of waters that were near her in the Los Angeles area, and after the white bass bite had just about tapered to nil, we went up shallow so I could show her how to use a slipfloat rig for sunfish. This is a universally applicable technique for sunfish wherever they occur. Fortunately, Di had some flyfishing experience, so, the roll cast motion often used in that discipline came in handy here. In less than a minute onsite near some shallow cover, she was fast to a sunfish and got the hang of it quickly. She and Tommy took turns just so they’d both have the experience under their belt and, between the two of them, they put 9 sunfish in the boat in just minutes. By 11:15 it was getting hot and bright, and the morning bite was over for sure. We headed in and bid one another farewell after a few quick photos of our four best white bass of the day — all in the 14 inch range. Skies: Skies were fair and ~15% cloudy. 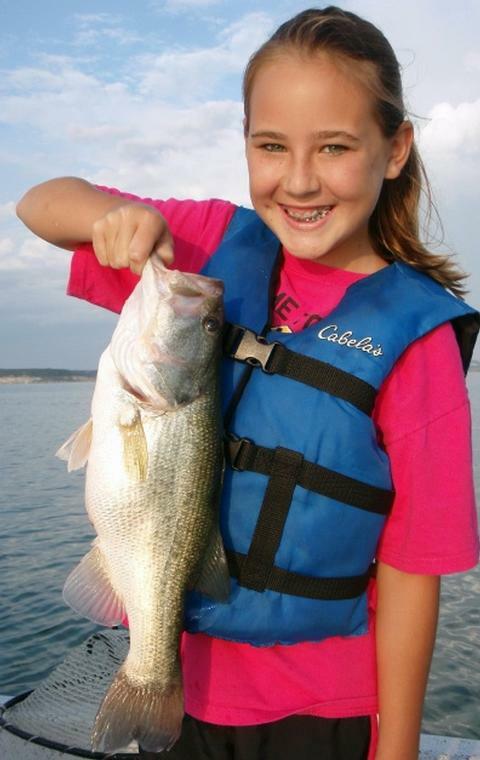 This largemouth bass was Darby’s largest fish of the trip, tipping the certified scales at 3 3/8 pounds. 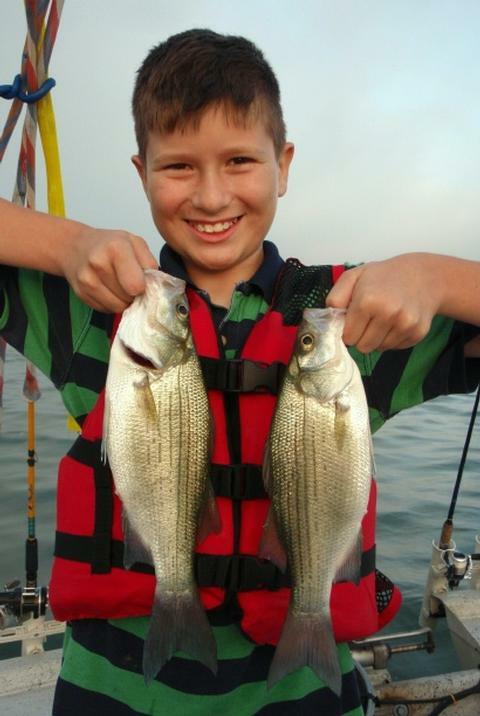 This pair of white bass was one of 6 pairs of doubles that Darby boated today. By the end of the trip he was telling me whether he had one fish or two on the line! If it seems it has been a while since you’ve heard from me, it is with good reason — the vast majority of Fort Hood’s troops are home safe and sound now with our nation’s chapter on Iraq closed, and no major Ft. Hood units involved in Afghanistan for the time being. Unfortunately, it won’t be that way for long, but, we’ll be glad they’re home while we’ve got them! 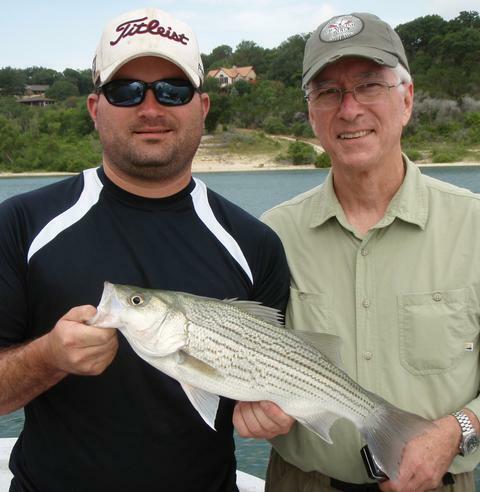 Today I fished with Darby Cox, the son of LTC Christoper and Michelle Cox of Harker Heights, TX. LTC Cox is on an individual deployment to Afghanistan where he is doing work in biometrics (like retinal scanning, etc.). He’s on a year-long deployment leaving Darby without his fishing buddy. Darby is a very articulate and well mannered kid and mature for his age (10 years old). He’s recently gone to a sailing school held on Canyon Lake and loves to watch River Monsters (so we immediately had something in common!). We hit Stillhouse today in a dense fog following some welcome rain the day before. We lucked out and found suspended white bass ready to put on the feedbag at the second spot we searched. As is often the case in the summer, these fish were right above the thermocline in about 26 feet of water. We used two tandem rigs both geared up with Pet Spoons (that’s 4 baits in the water at one time) on our two downriggers to get the job done. The best action of the day took place in the first 2 hours of the trip, but, even after that peak time the fish bit steadily enough to keep me busy reading sonar and steering the boat and Darby busy watching the rods and taking care of the rigging. A few times I asked Darby if he’d like to try a little something different thinking that working just one tactic for several hours might cause him to lose interest, but he stayed keenly interested in the downrigging the entire time. We focused our efforts between Area 482 and Area 40 today. Just once we broke from the downrigging tactic to cast bladebaits parallel to the contour in 28 feet of water after spotting multiple small schools of white bass holding on or near bottom over a 30 yard stretch. Darby put 4 white bass in the boat from off of Area 482 before this action dissipated. For our efforts today, we boated 3 largemouth bass (including our big fish of the day at 3 3/8 pounds), 3 drum, and 38 white bass. Only 2 of our white bass were under the 10″ “keeper” size limit, with the rest being at least 2 year classes ahead, at about 13.5 inches. I’m thankful for all the work you have put into fundraising and otherwise providing for the SKIFF program. When the floodgate of troops opens once again, we’ll be more ready than ever to support them and their families. Thank you! Skies: Moderate fog clearing to hazy by 7:30am, then skies slowly cleared to ~65% cloudy. This morning I fished with (Grandpa) Steve K. and (Grandma) Rose K. of Killeen, TX, and their 12 year old granddaughter, Madison, of Bryan, TX. The white bass “window” was open for about 90 minutes this morning … we made hay while the sun shone!!. This hefty largemouth bass was our largest fish of the trip, tipping the scales at 3 1/8 pounds. I first met Steve and Rose over at Belton Lake during the shad spawn back in April as we were pulling our boats out about the same time. We struck up a conversation and, long story short, got to fish with them and their granddaughter today as a result of that encounter. Madison was a bit bleary-eyed this morning as her flight in from a summer trip to the East Coast was delayed and she didn’t arrive in Central Texas until after 3 AM this morning. Undaunted, she was ready to roll for our 6:30 AM meeting at the courtesy dock. We started off making sure she could cast a spinning rig accurately enough to take advantage of any topwater we encountered (which was not to be today). As we headed out, the residual clouds from rain overnight kept the light level very low, so, we hung some bait for largemouth to wait for the skies to brighten and to see what the winds were going to do. No takers on the bait this morning. By 7:15, we had thinning cloud cover and the SE winds had gone all but flat with a light and variable S. breeze just barely puffing now. We checked out Area 041/480 and found abundant suspended white bass with a bit of baitfish thrown in. We got ‘riggers down and immediately began putting fish in the boat. The first 90 minutes of the day was by far the strongest action. We boated 24 fish within that time at this one area, and had 6 sets of doubles come up wherein two fish were caught at a time while using a tandem rig (Madison boated every one of these 12 fish). The next hour was a bit slower, giving up only 8 more fish, primarily at Area 197, again on the tandem rig fished 22-26 feet deep depending on where fish appeared on sonar as we passed overhead. Steve, who typically fishes by trolling crankbaits, was really intrigued by the downrigging setup we were using. The beauty of the downriggers is that, when used in combination with quality sonar, you can see the gamefish you are after, you can see your downrigger ball relative to the position of those fish, and, if the right lure is selected, you can know right where your lure will pass relative to the fishes’ position. In simply using crankbaits, Hell-Pet rigs, divers, or dipseys, there are so many more variables that you wind up never really knowing where your bait is, at least not with the “down to the inch” precision that you do with downriggers. I half-jokingly told my wife after I got home from the trip that I thought Steve might stop by at Academy before even going to the house following today’s trip, given his excitement about downrigging. By around 10 AM, we all knew the gamefish were about done for the morning, so, we turned our focus to the shallows and the sunfish they hold. I never know how older kids are going to react when we go from catching larger white bass to catching smaller sunfish. Today, however, I knew right away that all was well!! As we got to our first cove (Area 200), the moment her float went under and a lively sunfish came over the side, Madison said, “Now THIS is some SERIOUS fishing! !” and she proceeded to put the lion’s share of 39 more fish over the side of the boat from off of this area and Area 1111, as well. By quarter to twelve the hot sun, long flight, and fading fish action all added up to a good reason to hang up our rods for another day, and we headed back to the dock. Wind: SE3 early and until 7:30, then going slack for ~1.25 hours, then picking up out of the SW7-8 for the remainder of the trip. Skies: Skies were hazy and ~35% cloudy. 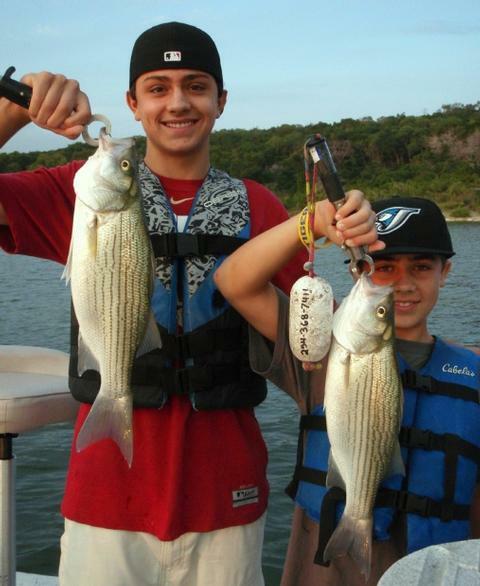 This morning I fished with brothers Matthew (age 16) and Andrew S.(age 12) of Pearland, TX. For many years now the boys have traveled with their parents to Belton Lake to spend the holiday in the same lake cottage near Arrowhead Point. Matthew and Andrew were fast learners and good listeners when it came to fishing techique, and it paid off in spades today with 22 keeper hybrid boated by just the two of them in just a few hours’ time. Chumming with Cheerios!! Keep reading for details! The boys’ mom, Allison, contacted me over the 4th of July last year only to find me booked, so, this year she started about 8 weeks in advance and we were able to make it happen in a big way. I picked the boys up and right off the bat we began searching for topwater, but found none (can I get an “Amen!” that we are long overdue for some good surface action???). Undaunted, we continued our search with sonar and, with a bit of help from some friendly-neighborhood herons, found some solid hybrid striped bass fishing action almost immediately. I decided to go with 4 shad-baited downlines and before we could get our 4th rod in the water we had a fish on. The action was very steady for the first 2 hours during which time we put 28 fish in the boat including 3 white bass, 1 channel cat, 1 blue cat, and 23 hybrid striped bass, of which 19 were “keepers” going 18+ inches. 6 of these keepers yanked the certified scale I have onboard down to the 4.25 pound mark. The bigger the bait the faster it drew strikes, with gizzard shad outperforming threadfin by a long shot. As we were fishing, a funny thing happened. I took one of our dead shad out of the bait tank and tore it up and tossed it over the side. Andrew asked why I did that. I told him the shad was dead, and that by throwing dead bait over the side, fish can become attracted to the area we’re fishing over. I explained this was called chumming. Well, Andrew had a big ZipLok bag full of Cheerios he was snacking on. He decided to toss a few Cheerios in the water, and, the instant his first handful hit the water, his rod bent double under the strain of a hybrid. Now that young man was convinced that his (still floating) Cheerios had something to do with his rod getting bit. From that point on, he ceased snacking and used his Cheerios as chum, convinced he was on to something!! Isn’t that just like a fisherman? By around 8:30 the bait bite slowed as the fish pushed away from shore and began to scatter horizontally, still around the 25′ mark. We ran sonar and I saw enough density to lead me to believe downrigging would be a solid option, not to mention a change of pace for the boys. We rigged up with a modified Pet Spoon tandem rig and a big Rapala. We got hit almost instantly and stayed in fish for about 75 minutes boating another 7 fish including 2 more keeper hybrid, a short hybrid, and 4 white bass, including a double landed by Andrew. Since the boys enjoy fishing and have access to kayaks at their rental place, I wrapped up our trip showing them a few techniques for smaller sunfish “close to home” so they could fish on their own just a short paddle’s distance away. We quickly boated 2 sunfish and 2 blacktail shiners — enough to get the boys to get the hang of it, and I then left it to them to pursue that from there. By 10:45 mom and dad were waiting at lakeside for their boys to return, only to begin making plans for another trip this time next year. Our tally was 39 fish today, with 22 of these being legal hybrid striper. I thought it no coincidence that this very solid catch came on the first day to include a westerly component to the wind in a very long while, despite the full moon. Wind: S6-7 early, then increasing to SSW9 by trip’s end. Skies: Skies were fair and ~20% cloudy. This morning I fished with father and son Larry and Adam H. Larry came out with me once before on a cold November day in 2010. Low temperatures were not a concern today!! This hybrid landed by Adam was our largest of the trip. It fell for a hefty 7.5 inch gizzard shad. Larry works in the oil business out of Houston and Adam is in construction in Dallas. The two linked up and had a pleasant overnight stay at the Hilton Garden Inn near Scott and White Hospital in Temple and then shot down FM2305 this morning where I picked them up at Temple Lake Park. The fishing was a bit sluggish starting out this morning. Once again we found no topwater action at first light and beyond sunrise. We gave Areas 1104, 1105, and 1106 a try right off the bat as they have been steady producers in the early mornings of late, but, this morning they only produced 2 blue cats and a missed keeper hybrid that pulled the hook out at boatside. We searched several more areas, found some fish, and got all but ignored as we presented live shad in these locations. Around 9:10a, our luck began to change for the better. As we approached Area 475/688 with downriggers down in search mode, we popped 2 white bass back-to-back, then boated a nice hybrid as we got even closer. As we got nearly on top of Area 475, we began to see eruptions on the surface, then a few more, then the entire area began to boil with aggressively feeding fish. This school consisted of large white bass (13-14″) and short hybrid (16-18″) and they were pushing hard after large threadfin shad going 4.5+ inches. We stowed the downriggers quickly and broke out Cork Rigs and Spooks and began consistently putting fish in the boat. We encountered a lot of missed fish at first, but a few refinements to technique eliminated a lot of that. This action went strong for about 40 minutes, then geared down and went for another 15 minutes before falling off altogether by around 10:40 or so. During this spree we boated a total of 20 more fish on both topwater and on several live bait rods I managed to keep down in between unhooking fish that the fellows caught on topwater. We experienced a lull until around 11:00 when we made one final move to Area 1106. There is a subtle breakline here and fish were loosely holding along and above it. We got live baits down to the fish at 25′ and got our final two hybrid (both solid keeper fish) here on gizzard shad. On these summertime live shad trips targeting hybrid, there can be slow times as you wait to see if a bite will develop once you get baits down to fish seen on sonar. Such times allow for good storytelling. Larry and Adam told me how, back during the Gulf War in 1991, they were living in Saudi Arabia while working in the oil business. As American troops moved in, many amenities were lacking. They told of how they enjoyed taking in U.S. soldiers to allow them to eat, do laundry, and make long distance calls back to the States from their home there and of how Adam (then about 6 years old) and his sister liked to get their photos taken with the troops. A lot of people talk about “supporting the troops”, but not so many really do it. Thanks, Larry! Wind: SE5-6 early, then increasing to SE12-13 by trip’s end. Skies: Skies were grey and humid the entire trip.